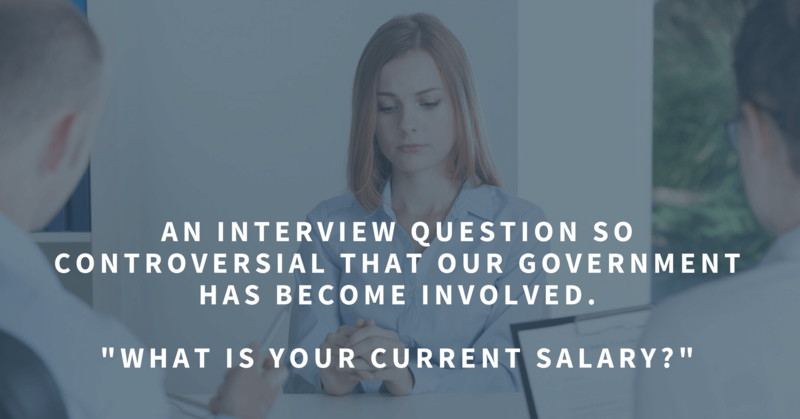 Candidates feel the practice is invasive, and some believe it is even aiding pay inequality for women and minorities, leading to legal bans on using this question during interviews in Massachusetts, Philadelphia and potentially many other cities soon. While the topic is highly controversial, there is one critical thing to remember during your interview: a recruiter is not your enemy. Let me explain why you should be as transparent as possible about your salary (and really, everything else). Salary ranges. Honestly, some companies have very tight budgets, and other companies are willing to really stretch to win the war on talent. When a recruiter comes into play in filling a position, the salary has already been established, and sometimes comes with little wiggle room. However, we do have several companies that truly partner with us and view us as trusted advisers. These clients want to know your salary expectations because they want to come up with the MOST competitive offer – they don’t want to lose top talent! Here is the question that we find suitable to answer: “Ideally, what salary are you looking for OR what is your minimum salary requirement?” This helps us understand your operating reality and represent you accordingly. BUT here is what you need to know about your answer – really talented, invested recruiters will know immediately if you are way off scope and have the right to challenge you. Be prepared to defend your position if you are throwing out a number that is completely out of range for the market or the opportunity. Behind-the-scenes negotiation. Some people LOVE to negotiate. As mentioned, there may be some wiggle room in the position’s set salary. If there is, we want to move it up as much as we can for you, without getting you involved in the negotiations. Contrary to some beliefs, recruiters aren’t trying to put you in any open job – we want to get you a higher pay, and we will fight for it on your behalf. However, imagine if we got you an offer for less than you were making – YIKES! 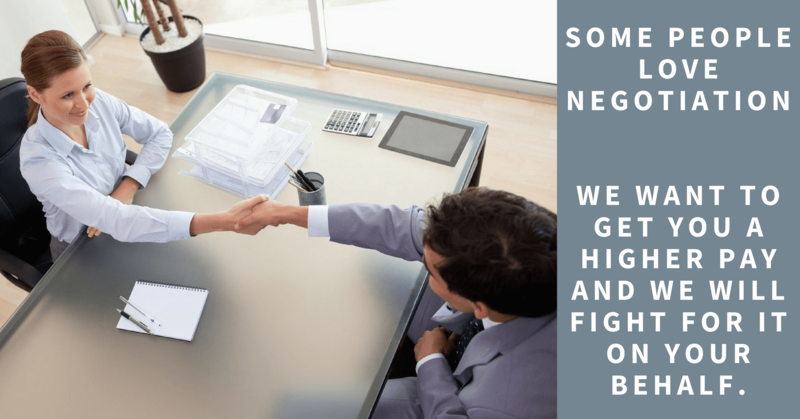 When we don’t know your expectations it can make our negotiating position weak, or create a back and forth that can seem disorganized and unprofessional. Are you looking at all aspects of the opportunity? This is often an area that is glossed over during salary negotiations and later recognized when it’s too late. Candidates get totally absorbed with JUST the salary. We are here to represent and negotiate all facets of your new position. 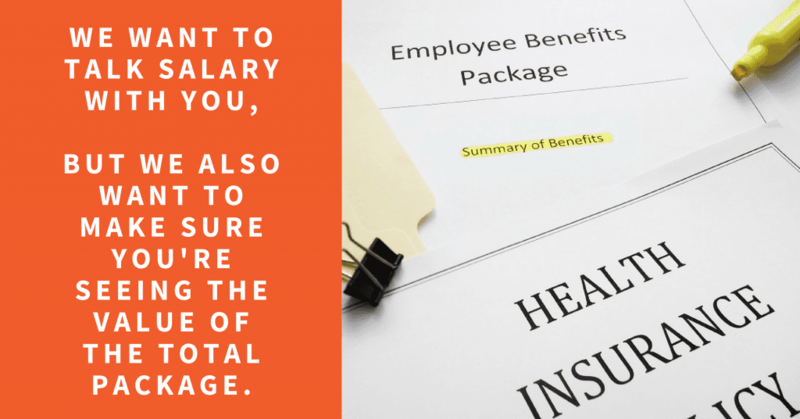 We want to talk salary with you, but we also want to make sure you’re seeing the value of the total package and all of the additional benefits. Sometimes the salary is a lateral move but there is a significant guaranteed bonus. Perhaps money isn’t the driving factor for you and TIME is – then PTO, a flex schedule or a remote work policy is of great interest (which can come with perks like eliminating after school care costs for you). What about a matching 401k, stock options or a benefits package that puts money back into your pocket through lower deductibles and reduced pharmacy plans? While we do want to get you top dollar, it is our job to represent our client companies and ensure you know the full picture of an offer so you can compare it with your current position. Recruiters work on commission. If we’re being totally upfront about salary concerns, recruitment is a commission-based career. When a recruiter places you at a job making more money, WE make more money. It is in our best interest to get you the highest possible salary when placing you into your next job opportunity. It is also our duty to represent candidates that are in range with our clients’ needs and have details gathered that match market realities. Reputation of your chosen recruiting firm. Trust is an essential part of any relationship, including that with your recruiter. There are measures you should take to ensure you have chosen the right staffing partners. First, be sure to find a staffing firm with a great NPS score – this means they have been rated well by other candidates who have worked with them (check out the Best of Staffing website and see if they’ve won an award – it is a huge market differentiator). If they haven’t participated in the Best of Staffing, it doesn’t mean that they aren’t a top rated firm – just ask them their current NPS scores. If they don’t know, this could be cause for concern. Additionally, search for reviews on Glassdoor and check out the comments on their Facebook page to ensure they are reputable. These are critical when choosing a staffing partner to represent you! When you work with a recruiter, don’t be afraid to ask reciprocal questions, such as: Is there a salary already set for this position? Ask your staffing partners what the salary range for your position, industry and location should be and do your own research on PayScale and O-Net to cross check their answers. Arm yourself with this knowledge so when salary comes up, you’re well-versed and know where you stand. A great staffing firm will be your trusted adviser and biggest advocate in your job search – as long as you let us! Need assistance finding your next opportunity, or even a career consultation from an expert in your industry? We are here to help! Get in touch with us today.